The Nickel Iron battery from ‘Iron Edison’ is an updated version of Thomas Edison’s battery design that he considered to be nearly perfect. For off grid energy storage and renewable energy systems, this battery will likely be the last one you’ll ever buy. Why? Because it’s nearly indestructible! Edison’s battery recipe used iron oxide and nickel hydrate, without the corrosive acid-based electrolyte used in today’s lead acid batteries. The result was the long life Nickel-Iron-Alkaline cell. The Nickel Iron battery features the longest life span of any battery ever invented. -Rated for 11,000 cycles, or 30 years of daily discharge! – Completely resistant to freezing. – Tolerant to overcharge & over-discharge. – Supports 80% depth of discharge. – Daily deep discharging has no impact on battery cycle life. – Fully compatible with industry leading inverters and charge controllers like Schneider, Outback, Magnum, MidNite Solar and SMA. – Available in 12, 24, and 48 Volt configurations. – Retains ~ 88% of capacity at 32 °F whereas lead acid is typically significantly worse. – Capacity is ~ 118% of rated at 68 °F whereas lead acid 100% capacity is typically at a higher temperature. Iron Edison is the only company to have tested the Nickel Iron battery at National Renewable Energy Laboratory in Golden, CO. Tests confirm that the cells over-perform at the 5, 10 and 20 hour discharge rates by nearly 20%! – They may require water every 6-8 weeks. – Electrolyte refresh every 8-10 years to keep capacity. – They do have some hydrogen off-gassing and require a ventilated area. They are ideal for off-grid applications where they stay healthy in a constant-charging environment that would be destructive to other battery types. For those who are serious about off grid systems, a cost analysis over an extended operational time will prove that Iron Nickel batteries outperform. The initial outlay is a good chunk higher than lead acid batteries. Again, the will likely be the last battery you’ll every buy. They will last ~ 30 years while lead acid batteries will be done in ~ 5-7 years. That means your replacement cost analysis of lead acid batteries should be multiplied 4 to 6 times in comparison. But there’s another cost factor to compare: Capacity! The Iron Nickel battery far outperforms regarding usable capacity (80% usable) while lead acid should NOT be discharged beyond 50% and recommended to only discharge 30% for longest life. That’s a BIG difference when you’re factoring in cost (the number of batteries you’ll need to achieve a given capacity). So after factoring both (replacement costs and capacity needs), the Nickel Iron battery might be a good choice for your off grid energy storage. Brandon over at IronEdision.com will gladly answer ANY of your questions about this or any other alternative energy needs. They’re located in the Denver area and will be glad to help. Ken are you thinking about changing over to this technology? Has anybody on this list started using this Nickel Iron Battery technology? Has anybody on this list experience in refurbishing lead acid batteries? Any real life experience in using refurbished lead acid batteries? I’ve seen folks overseas salvaging old batteries from our military trash and refurbishing them/rebuilding them into serviceable deep cycle batteries for their small solar arrays. Knowing how to salvage and repurpose is my way of SHTF prepping. @NH Michael, When my current battery bank goes belly up, I will consider all options, including this one. I currently don’t know anyone personally who is using nickel iron battery technology. Most are using lead acid. I found the nickel iron technology intriguing due to it’s longevity and ability to discharge safely down to 80% (effectively increasing usable capacity). One would have to do their own cost analysis to decide if it’s worth it for them and their own situation. I have not investigated refurbishing. I’m busy enough as it is! They’re definitely worth considering for those who are designing a long term off-grid energy storage. Hopefully this will help those who may come across this article while doing a search for nickel iron batteries. When it comes time for me to replace my current battery bank, this will be one of the types that I will consider. Hopefully your going to continue a “series” in the Solar Power lineup. I have been doing online research, unfortunately 99% of what’s out there is all a sales pitch. The batteries and systems from IronEdison are fantastic but ouch on the direct cost from them, hence I’m looking on a hybrid system, parts and pieces so to say. Lastly, considering the “State of the World/Country” even just a small 1000-watt system would be a God Send if/when. Heck, I wonder how many even have a Solar Battery Charger? I can run my Ram with three axle (5200) trailer from GA. to Denver and back for a lot less than 10 k. Even a cheap air ticket and rent a one way box truck should be a lot less. We are looking real hard at the 22k $ system as we have only back-up generator now. You my see a very large white Ram with trailer fly down the road this spring. Its the ocean freight thats the real killer, hazmat fees for the batteries, then theres an extra charge for the weight, it made me really hesitate, im sure i could have shopped it downna bit but not enough to really matter. If the prices posted are not FOB Denver, CO than these folks can pack sand. When I build a house the price is tune key. Can’t later start talking dump fees and site prepare and other fees. Will check these folks out with a no B.S. deal or bye bye. Is there any difference in the type of batteries regarding the holding of a charge over time – we get periods of weeks with little sun. I am reluctant to have a grid tie-in or the running of a generator frequently. I would consider this system to be a back-up for grid down emergencies, not a daily contributor to my electrical usage. Just thinking long term. Holding a charge over time isn’t the best way to think about the battery situation while not in use. Rather, keeping the batteries ‘floating’ or trickle charged will assure that they stay healthy. By having a battery bank in the first place will presume that there’s a means to charge it. And that charger should also have the ability to ‘float’ the batteries. That said, generally speaking, a fully charged battery bank will self discharge over time, but it would take quite some time to become a big problem. For example my current battery type spec sheet indicates a self discharge less than 3% per month. So if I never used them, I would want to recharge them fully within a year. Might be a good rule of thumb for healthy batteries when not in use. Thanks. With only three or four days of direct sun in a month, Oct to Mar, there would probably be enough to keep the batteries healthy. But, i’m still mulling over the investment for this location. Ken, a question. Some 10-12 years ago, I had a conversation with a gentleman whose solar panel array behind his home had caught my attention. It was large, very large. As I recall, 50 kw. He was wealthy, at least for our part of the country. He told me, if I remember correctly, that the total installed cost was around $50,000. He went on to explain that approximately half that cost would be recovered through tax credits and the rest should be covered by the electricity he would sell back to the grid. Since his system was grid tied, I’m not sure he had battery back up. If not, the systems available from the source you linked are actually pretty reasonable in price, since they include these clearly superior battery bank. Now my question; are these tax credits still available, and if so, does that apply to non-grid tied systems? My 2¢, end of last year I did check on the Fed Tax Credits (30% of the cost of the total system, including Labor), and yes they were still in place even though some had pushed to stop them, now for the new 2018 Tax, I have not checked, but I have not heard of them going away. I did understand the credits were extended for approx. 10 years. Regarding the tax credit, they are still available. And it doesn’t matter if grid tied or not. I used Form 5695 when I took mine. I received 30% credit on my taxes on what I had spent for my system. The credit will be phased out gradually between 2016 and 2023. The claimable amount will remain at 30% for all systems on which construction is begun before the end of 2019, is reduced to 26% in 2020, and 22% in 2021. After the year 2023, the residential credit will be eliminated and the commercial and utility credits lowered to 10%. This does look intriguing. One of the options that we are considering is a bank of batteries to run our well pump during power outages. Although our location just wont work for solar, I believe we can still use a battery set-up with a trickle charger. This would appear to fill this niche. I will have to look into this a bit more. I have looked at this exact situation before. If the tax credits are still available, and if they only are applicable to grid-tied systems, I would think that you always have the option of “spec”ing a system as grid-tied with the option of adding a battery bank and a couple of battery chargers at a later date. It is still your property, you are paying for it but getting a tax credit for helping out the local power company so they don’t have to burn so much fossil fuels. Install the battery bank the day after the inspectors certify your system as grid-tied! Let it feed their system for a while to get whatever payback you can. In a grid tied system their system becomes your battery. So if at some time in the future you want to disconnect from being tied to their grid (or their grid stops supplying you with power) you will definitely need to have a charged battery bank online and ready to feed your lifestyle. To compare battery systems, I will use my system as an example. My system is a 48 volt system using Rolls Surrette S 605 batteries. I am not advertising their battery by the way. this is just my system. The total kilo watt hour capacity is 86.4. For max life ( 7 years at best @ $ 12,544 per system) I only use a 50% discharge, or 43.2 kilo watt hour. For 28 years the replacement cost ( at today’s battery cost) for my system would be $50,176. When I got a quote for the Edison battery system of equal kilo watt hour capacity the cost was $72,000. The maintenance of my battery system is a real pain in the a$$. The cost of refurbishing the Edison battery system was expensive. I purchased the lead acid batteries because after a SHTF event the replacement battery fluids for Edison batteries would not be available whereas I can and have rebuilt lead acid batteries. I hope this provides some insite into your purchase decisions. Texas boy could you share information on the rebuilding process maybe the Weekend Free for all session? Sources of information is important as sooner or later we will all be scavengers reusing things we can get our hands on. The S 605 is apparently rated for 468 AH (@ 20 Hr rate). So it sounds like you might have 4 strings in parallel? 32 batteries? That would total 1,872 AH of which you are using 50% (the recommended max for lead acid), or about 900 Amp hours (43,200 kwh). 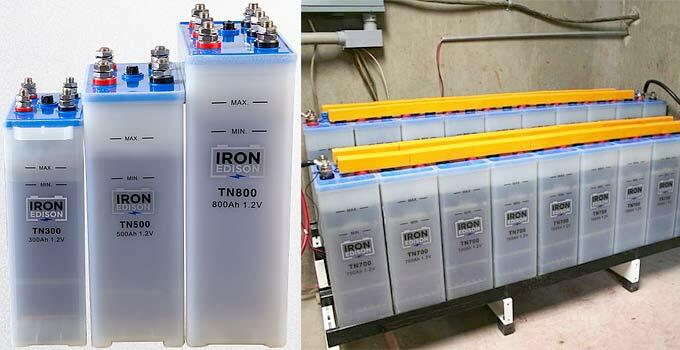 Looking at Iron Edison, a 48V 1,000 AH battery bank retails for $37,000. This gives you 800 AH usable (80%). Although to be more comparable we might consider a 1,100 AH bank which will provide ~ 900 AH. This apparently lists for ~ 40K. Looks like you could replace your ‘S 605’ bank 3.2 times (7×3=21 years at best) for that. That’s if the lead acid batteries last for 7 years – which they reasonably should if they’re not regularly heavily discharged. 50% on a regular basis will definitely shorten the life span. Potentially by several years depending on the battery design itself. So it does look to me as though the Nickel Metal battery bank would last at least an additional 7, maybe 10 years than the 3x equivalent swap out of your lead acids. Potentially saving $12,000 or thereabouts after 28 – 30 years. Also saves the tremendous hassle (and back breaking work) of swapping out battery banks. Thanks for sharing your system specs. The Rolls battery has a very good reputation. Also, you mentioned “The cost of refurbishing the Edison battery system was expensive.” I have not investigated this yet (the cost). Their site says “Electrolyte Refresh Rate: Suggested every 7-10 years to sustain maximum performance”. And yes, if I were planning for SHTF I would try to keep on hand enough for a refresh. Again, I have not investigated this cost. I suppose it’s quite fair to factor that in when comparing! Also as you replace those batteries over time, I believe the cost will be much higher every seven years actually making the Nickel Metal battery bank even cheaper. Say you buy your batteries today at $10,000, what will those same batteries cost in 7 years? Going by todays inflation, I would take a guess that in 7 years those batteries will now cost you between $11,000 – $13.000. Then go down the road another 7 years and what would the cost be at that point. In the long run I think the Nickel Metal batteries just might be the better deal. My wife had not seen this system before, she’s the one with the Masters degree and the brains in this outfit. We have a back up generator (LP) that kicks in if the power goes out. I have built a wood gas unit that will run a 10k Onan twin cylinder generator rescued from a burnt motor home. Have been building a HHO gas flash boiler to run a 8 hp steam engine the last few months also. But if I could just buy a full unit plug and play my life would be good. YOU THE MAN! Ken, can we also add in the 30% tax credit on that 40k for the 1100AH bank? For U.S. purchasers anyway. I am friends with one of the owners of MidNite solar. He is a fellow Ham like me. He is a great guy and his company is top notch. Definitely do business with his company. I couldn’t recommend anyone else. I have purchased a number of items from them, including their popular charge controller. I’m currently running their ‘Classic 200’. Good company. Yes, it is a great company. I have known Bob for probably 13 years or so. I met him through an Amateur Radio Club, The Snohomish County Hams Club, I was the President at one time. Take Care and stay warm Ken!!! Our Nickel Iron battery is made by military quality machines and technology, but factory is not in Zhuhai, we are one of sell office. The 1200Ah is USD720/pcs based on 40pcs, and the delivery time is about 50 days. Please check if this is acceptable for you or not. If okay, when goods ready, we can send to your partner Stella, they can make the test for you, this should be more meaningful. Thirty years ago plus I installed mainline telephone exchange systems (city systems). These were electromechanical systems which drained hundreds if not thousands of amps at 48 volts during peak periods. I installed battery systems ranging in size from 100Ah to 4000Ah. They were lead acid stationary type – especially designed for high loads. The batteries were delivered dry. On installation they were filled with acid and charged at the 10 hour load rate. It helped to cool the acid down to near 0 degrees centigrade before charging. We generally bought a tonne or so of ice and cooled the battery acid containers down in this. These lead acid batteries would last for 20 – 30 years.. There were some conditions for this life. They were specially made for purpose. This means a large well underneath the plates for detritus to accumulate. (It’s the detritus that kills and shorts out the plates that kills cells). They were constantly on trickle charge using a smart (electro-mechanical) rectifier. Battery acid levels and specific gravity were monitored. The batteries required a special ventilated room with an acid proof floor. Aprons, goggles or clear face masks and thick rubber gloves were on hand for maintenance purposes. These were changed every few years regardless of being used or not – rubber hardens and cracks. Batteries were typically 48 volts nominal made up of 24 x 2.2 volt cells. The float voltage was set for 52.8 volts. The rectifier floating circuit monitored the float current and corrected it to as little as possible – you don’t want the batteries constantly charging. The largest set I installed was 4000Ah. These cells were glass and mounted on wooden blocks. Each individual cell was nearly 18 inches square and 2ft 6 high. There were two banks of 24 cells -so 48 cells all together. The rectifier was very large and ran on 240volt 3 phase. (440 volts). The batteries would discharge right down to 15 – 20% after which the discharge panel would cut out. Heavy discharge under 15% results in warped plates. Usually in a telephone exchange situation there would be a back up genset in case of city mains power outage and the battery was there for use only for an hour or two. You want more Ampere hours – you need a bigger battery with bigger plates – it’s a matter of physics. The biggest enemy of batteries is heat. You need to be careful when recharging or simple charging batteries – not too much current. Heavy current involves heat. Heavy current heats up the electrolyte – it can boil. Batteries have an internal resistance – even though very small some current is dropped across this resistance. The resistance is mainly in the electrolyte. Battery charging is best achieved using the 10 hour rule. e.g 100Ah battery divided by 10 – i.e. 10amps going in for 10 hours. You need a smart rectifier charger for this. Trickle charging a discharged battery is no good for it. The structure of cells and batteries is limited by physics. Put too many cells in or too close together or use exotic materials result in Tesla fires, Boeing Dreamliner fires and are the reason why some laptop or general batteries are banned from aircraft. I see many nonsense claims from “scientists” announcing the latest “breakthrough in battery technology”. The reality is that most of these “breakthroughs” are only reproducible in laboratory scenarios and are of no use in every day situations. Usually announcements are made in line with a plea for funding. if you are wondering. Lead acid batteries make up 80% of production. It’s 250 year old technology. There’s a good technical reason for using them – partly economic. You can rehabilitate lead acid batteries quite easily. The best ones to do this are in rubber cases. The drawback is using dangerous acids and poisonous substances like lead. P.S. When charging a battery you monitor the specific gravity of the electrolyte – not the voltage. I’m Impressed with Iron Edison, Very helpful staff, they gave me a free system design and I am happy with the Nickel iron batteries They put a 10 year warranty on the batteries which is much appreciated when making an investment. I will be a returning customer and would recommend Nickel Iron Batteries to anyone with batteries that need replacement. Thanks Aaron, the info is much appreciated! is 720-432-6433 still the right number for Edison Battery?